I still can't get over how they shrunk Chris Evans for the early years of Captain America: The First Avenger - that's what a diet of Twinkies and junk food will do to you. 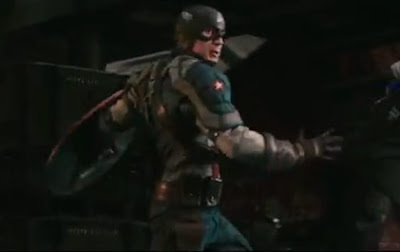 Inject a few vegetables (or 'super soldier formula') and look what happens - instant Cap. Great minds and all, I found this last night too. I am so psyched for this movie now. Each trailer looks better and better. I think this may be the movie of the summer. I agree Craig -from the 'dive on the grenade' scene to the Mission Impossible feel, I'm now thinking this could be the biggie! and that line "I'm just a kid from Brooklyn". Now that is just straight up pimpin'! "I'm just a kid from Brooklyn!" LOL represent!! I think y'all are right Dan, this could be the blockbuster Hollywood has been waiting for. Still it's odd how that line is the core of Marvel. Regular guys, doing great things. Nova, especially used to use that line a lot. It's always easier forking out for a film when you know they have the basics right.